We’ve reached number ten. We’ve seen The Undertaker become The Deadman. He has taken on the likes of Jake Roberts, Kane, Triple H, Psycho Sid and others, but at Wrestlemania XVIII, it was The Nature Boy who had something to say about The Undertaker’s Wrestlemania Streak. At the time, The Nature Boy had half ownership of the WWE after the invasion by WCW and ECW. Flair used the power to do a lot of things. One of which was interfering and blocking Big Evil from using a lead pipe on The Rock during a match at No Way Out. Immediately afterward, Taker challenged Flair to a match at Wrestlemania, but Flair said no numerous times. It wasn’t until The Deadman attacked Flair’s friend The Enforcer Arn Anderson and eventually his son David that Flair was prepared to step into the ring with The Phenom. The revenge consumed Flair and his anger led him to be arrested and stripped of his power within the corporate structure of WWE. Flair vowed only vengeance and to even the score at any cost. The bout was made into a no disqualification match which set fine with both men. One to exact revenge and the other to do what was necessary. In front of 68,000 strong in the Skydome, on the same night Hogan would battle The Rock. The Undertaker would secure win number ten against The Nature Boy Ric Flair. The Undertaker rode his way out to the ring with “Rollin'” playing throughout the arena. Even Big Evil Undertaker was awesome when he rode his bike down to the ring. The Undertaker didn’t miss a beat. He looks intense and ready to lay someone down the hard way. Just as The Deadman sets in, someone told Ric Flair there was a party in Toronto. The “Wooo” is heard through the arena as the robed Nature Boy makes his way down the aisle. His walk is consistent and his mind is determined to enact pain until on The Deadman until he reaches his clarity. Flair’s walk turns into a strut and then a jog. The robe comes off and Flair sprints into the ring and the bell sounds. Flair beat and battered The Undertaker around the ring and knocked him to the outside. The Dirtiest Player in the Game tackled Taker over the announce table onto the floor. Ric pounded away on The Deadman. Flair is aggressive and obviously out for blood. Flair continued to dominate physically until Taker used his body to knock Flair down. Back in the ring, Taker climbed against the ropes as Flair knocked him out to the floor on the other side of the ring as well. The tide turned when Flair attempted a crossbody that The Deadman would see, he’d catch Flair and drive him into the ringpost back first. The Undertaker knocked Flair around ringside and into the steel steps. He then placed him inside the ring to control the match. We’ve seen The Undertaker dominate guys and we’ve seen him overpower and beat men, but this Undertaker wants to destroy people. He’s in the business of making people famous and destroying their spirit. The Undertaker beats Flair into the corner and pounds on him with rights in a brutal sight to behold. The Nature Boy has been dusted wide open by the strikes of The Undertaker. Taker focused on the wound and threw powerful right hook after right hook. When that was over, Flair was brought into the ring the hard way. 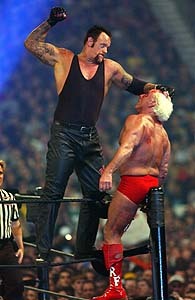 Back in the ring, the blood poured down the face of Flair as The Undertaker pushed and beat him across the ring. Flair got a fury of offense with patented chops to The Undertaker, but he would reverse an Irish whip to put Flair in the corner and then hit a huge running clothesline on him. Flair was beat across the ring and placed on the top rope. The Undertaker went to the top, threw a few punches to Flair and the two men hit a gigantic superplex that made the crowd jump with the pain of the landing. The match could have been over, but The Undertaker raised Flair’s head as if to say there was still more punishment to come. The valiant Nature Boy tried for some offense, but he has been really beaten down. The Undertaker maintains physical control. The Undertaker decimated Flair across the ring. He even hit a huge leg drop on the ring apron. After a pin, The Undertaker refused to let Flair lose so early. 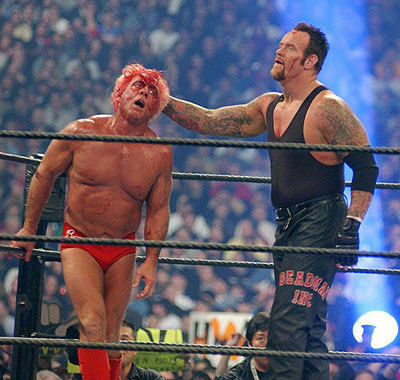 Taker knocked Flair around the ring as Flair’s face was as red as his trunks. Flair tried a burst of offense, but The Undertaker is too in control right now. He drags Flair, twists his arm and ascends to the top rope for some Old School. In a flash, Flair was able to pull The Undertaker down and buy himself some time. Ric started a rally, but Taker squashed it with a sidewalk slam. Flair recovered quickly enough to dodge a big boot that caught The Undertaker on top of the rope. Flair unloaded with chops to send Taker to the outside. Flair had a burst of life when he reached into the motorcycle and pulled out the lead pipe that started this whole thing. Ric bashed the pipe over The head of The Deadman. He continued the beatdown anywhere he could on Taker, but Taker regained control with a push into the apron. On the outside, Flair was able to reach for a solid sign that said, “Keep off” on it to hit The Undertaker with several times back into the ring. It was Flair’s turn to hurt The Deadman as he loaded off with punches in the middle of the ring. For the first time, JR asked the question, “Can Flair stop The Undertaker’s Streak?” To my knowledge it is the first time someone has really asked the question out loud at Wrestlemania. This passed over as Flair went for more damage to only have his throat grabbed by The Undertaker. Taker thought he had control, but the Dirtiest Player in the Game kicked a low blow unto the Deadman. Flair followed it up immediately with the Figure Four Leg Lock in the middle of the ring and The Undertaker is in trouble. It actually occurs to me that The Undertaker could tap out, but then I remember that its The Undertaker. After a half a minute, The Undertaker breaks the hold by sitting up in vintage Taker fashion. He grabs the throat of Flair in a hell of a visual and chokeslams him to hell. Ever the resilient veteran, Flair kicks out somehow. Out of frustration, The Undertaker batters on Flair and then targets the referee. He takes out the referee and goes back to the pipe. With pipe in hand, The Undertaker takes a series of chops and an Irish whip from Flair before he ducks out of the way and Arn Anderson comes out of nowehere to hit a huge spinebuster on The Deadman. Were it anyone else, they would have stayed down, but The Undertaker kicked out a two. The Undertaker made a B line for Anderson on the outside. Arn was busted open and got a big boot for his trouble right in the center of the ring. The Undertaker put Arn into a Dragon Sleeper to torture the man until Ric Flair returned with a steel chair to the back of The Undertaker a few times before The American Badass put Flair down with a huge big boot. The Undertaker went for the Last Ride, but he either couldn’t lift Flair for the move, or Flair didn’t know how to do it. Either way, The Undertaker gave up after a few tries and picked up Ric Flair for a Tombstone Piledriver and his tenth straight victory at Wrestlemania. To cement his heel persona, The Undertaker had his hand raised by the referee only to lay him out as well. The carnage around The Deadman is unbelievable. The Undertaker stood up straight on the apron and held his hands out for a ten count. Ten consecutive victories at Wrestlemania is a milestone that no one else has reached. WE’ll let you know when anyone else in wrestling history comes close 22.